Here at the Book Arts Center, we’re well known as a print shop. But what about bookbinding? Just like printing, bookbinding is a major part of the book arts! Book binding, as the name implies, is the way in which pages are sewn together to create a book. There are many different styles of bookbinding, from the simple pamphlet stitch, to more decorative styles like secret Belgian bookbinding. Different parts of the world have different ways of binding books. For example, stab binding comes from Japan. Today, these decorative styles of binding are most commonly done by hand binders. Modern bookbinding is divided into two categories. Hand binding, obviously, is done by hand and may be used to bind artist books or to repair old books. Perhaps the most common type of bookbinding today is commercial binding. Commercial binderies use machines to bind large numbers of books, like New York Times best sellers. Much like we preserve and teach people about original methods of printing by offering letterpress workshops and hand-printed merchandise in our shop, we also preserve and teach people about original styles of hand-binding books. We hold workshops in different kinds of bookbinding, from coptic stitch bookbinding to Islamic bookbinding. We also offer handbound journals for sale in our shop from our consignment artists. WNYBAC member and consignment artist, Janna Willoughby-Lohr, owns her own business, Paper Craft Miracles, for which she makes everything by hand. Paper Craft Miracles is a lot more than just handbound books. Janna also makes handmade paper, cards, and more. She was inspired to start bookbinding when she took an artist book course in college. Janna says her favorite part of running her business is completing custom orders, and getting creative to fulfill all the specifics of the order. In addition to running Paper Craft Miracles, Janna also teaches bookbinding. 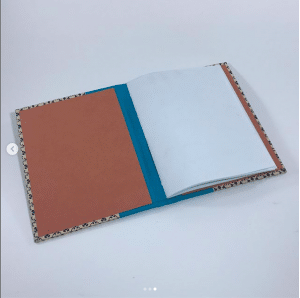 She describes herself as “the Bob Ross of bookbinding,” because very few mistakes one could make while learning to book bind can’t be fixed or covered up with something pretty. She loves to see her students get just as excited about the versatility of bookbinding as she does. A common question we get here at the Book Arts Center is, do we offer any binding services ourselves? While our shop doesn’t actually do any bookbinding, we have relationships with several Buffalo binderies that do! One of our members, Kathleen Hartmans, owns Quality Bindery. Quality is a small commercial bindery located in Buffalo’s Black Rock neighborhood. Quality works with the printing community in the Buffalo area to fill printing needs for organizations like Just Buffalo Literary Center, and the Burchfield Penney. Quality also rebound the Deed books for Erie county and completes individual orders for restorative binding in their hardcover binding department. Another local bindery we work with is Red Fern Bindery. 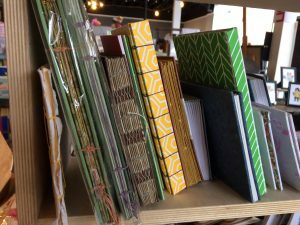 Red Fern does all kinds of binding, from fine bindings in leather with gold lettering, to making new books, to making clamshell boxes for protection and display. According to Linsey Buchlis, the heart of the bindery is repairing and restoring old books. Modern bookbinding is also art. While hand bound journals are certainly very beautiful and artistic, some bookbinders even take the artistry of bookbinding a step further. Deb Eck, one of our members and workshop instructors, is one such book binder. This past September, WNYBAC welcomed Deb as an exhibition artist. Her exhibition, “embroidered,” featured a number of intricately hand-bound books, among other artworks. Deb’s lovely books are works of art for display rather than books to be used for reading and writing. She uses embroidery to decorate the spines of her books, sometimes spelling out entire words in the spines, like in her piece A Woman’s Work is Never Done. Bookbinding, even the older hand-techniques of binding, is alive and well! Bookbinders use their skills for everything from creating and selling hand-bound journals, to restoring old books and running commercial binderies, to creating elaborate works of art. Do you want to learn how to bind books, or diversify your book binding skills? Take a workshop from one of the bookbinding artists featured here, or one of our other talented teaching artists. We offer bookbinding workshops throughout the year and in many different styles of bookbinding. A hand bound book will certainly be a unique edition to any bookshelf! Posted on January 27, 2019 by Rosemary Williams.